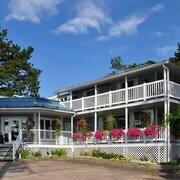 Situated on the waterfront, this hotel is 11.6 mi (18.7 km) from Walleye Interpretive Centre and 17.1 mi (27.6 km) from Chute du Brule. Stayed at the end of February to enjoy some snowmobiling. The Comfort Inn is located close to trail 63 with easy access to trail. Gas station across the street. Restaurant/bar attached to hotel with great service and food. 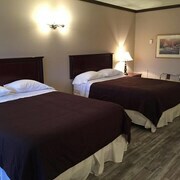 The room was very clean and the staff was very pleasant and helpful! Where to find Ferme-Neuve hotels near an airport? Where can I find hotels in Ferme-Neuve that are near tourist attractions? Expedia's extensive Canada accommodation database offers 4 hotels within a 0.1-kilometre (0.06-mile) radius of Ferme-Neuve. 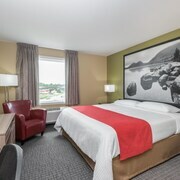 The Quality Inn Mont-Laurier, Quebec, which is the closest accommodation, is located 30 kilometres (17 miles) from downtown Ferme-Neuve. Another nearby alternative is the Best Western Plus Mont-Laurier, located in Quebec, 30 kilometres (17 miles) from downtown Ferme-Neuve. 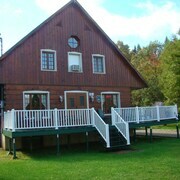 The Comfort Inn Mont Laurier is located 30 kilometres (17 miles) from the center of Ferme-Neuve. 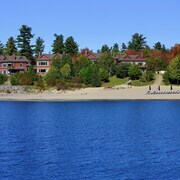 11 kilometres (7 miles) away is the Village Windigo which is another option. The Parc Georges Painchaud is a often visited place of interest here. 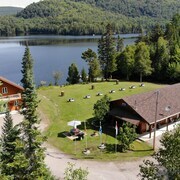 Stay the night in Lac-Saguay, which is 45 kilometres (27 miles) to the southeast of central Ferme-Neuve. Take your pick from the Motel Ours Bleu and Motel Dodi. If watching sport is a favourite pastime, head to Circuit Mont-Tremblant, which is 100 kilometres (62 miles) to the southeast of Ferme-Neuve. Sports fans wanting to find a bed close to the stadium can choose from the Les Manoirs - Tremblant Sunstar or the Hôtel Quintessence. 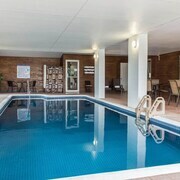 Thank you for taking the time to explore our Ferme-Neuve hotel listings. Be sure to spend a few minutes exploring Expedia's Ferme-Neuve travel guide for the low-down on this area's things to see and do. What are the most popular Ferme-Neuve hotels? Are there hotels in other cities near Ferme-Neuve? What other types of accommodations are available in Ferme-Neuve? Explore Ferme-Neuve with Expedia.ca’s Travel Guides to find the best flights, cars, holiday packages and more!